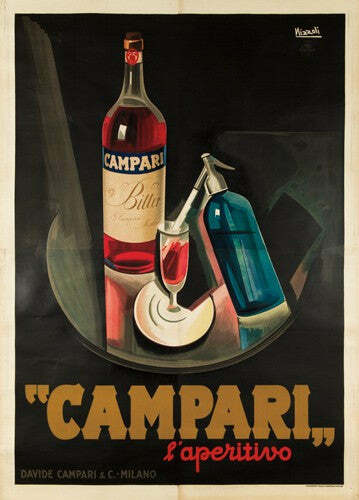 On Sunday, February 12, a New York auction house will host a specialty sale of over 400 food and wine related vintage posters, led by a classic from Campari. A stunning history of eating and drinking through advertising will be offered, from the whimsical charm of Art Nouveau to the striking boldness of Art Deco to the simplicity of Modern design, all celebrating the culinary arts. Internet live bidding will be available. The auction will begin at 11 a.m. local time. This visual feast covers every aspect of 'gastronomica' (food and drink memorabilia), including original advertisements from the past 150 years for everything from wine, beer and champagne, to cheese and chocolate. Posters advertising food and wine are some of the most iconic designs of the 19th and 20th centuries, visually expressing the universal joy of eating. The original art in this auction embraces that shared delight, revelling in all that is tasty. Philip Weiss highlighted posters as a potential investment area in our interview with him, and whilst it's natural to concentrate on music and film, food advertising brings the power of nostalgia into play too. Highlights of the sale include over 25 posters by Cappiello, Nizzoli's powerful billboard for Campari, menu designs by Alphonse Mucha, a unique image by Henri de Toulouse-Lautrec for a celebratory banquet, and the complete Levy's rye bread suite from the late 1960s. The posters be on view, free to the public beginning Friday, January 27 through Saturday, February 11. Posters can be an affordable way of collecting stunning images. We are currently offering several high quality examples from our stock including an avant-garde poster advertising the Crazy World of Arthur Brown and a California League of Sexual Freedom Poster.